Here's a speed painted concept for the location of Ophelia Twist - Van Daemon's Town. It's pretty obvious to me now that my mental image of the place is far more grand then being just 'a settlement' ... I might shift it to being an established 'beggar city' - an isolated place where all the rif-raf of the empire are dumped. Shown here is the main canal where many of the larger, more solid buildings have been established. The inhabitants lower 'Scum Catchers' into the silt-river below to grow the Kelp that keeps the majority of the inhabitants alive. Floating high in the background is Saint Maxamillion's Cathedral, seat of power for the Church of the Holy Pleroma on the moon Arcadia. The Church is wealthy enough to afford the Cavorite necessary to float the cathedral. Many see the Cathedral's separation from the city as a sign of the Church's disdain for the inhabitants. 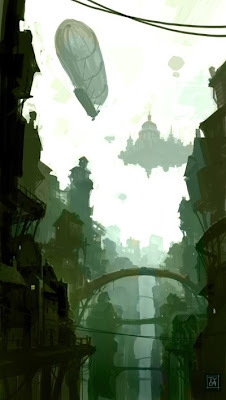 Also seen floating above the city is a more conventional airship, balloon floated and steam driven.